There’s no place like home and more people are opting for “staycations” by creating personal backyard retreats. If you have a family with school age children, are a “Baby Boomer” with adult kids and grandchildren or are a person who loves their home, a yard with amenities such as a pool, hot tub, outdoor cooking area, firepit, outdoor fireplace, foot paths and gardens is a delightful haven. The best part is that it’s just outside your back door. We created the ultimate backyard retreat for homeowners in Indian Hill, Ohio who love spending time with family and time alone. The project started with the homeowners’ love of nature, gardening and innate talent for landscaping. This project won a National Association of the Remodeling Industry (NARI) Award for Contractor of the Year for Exterior Specialty. Protecting the existing trees from damage during the course of the project. A lagoon-style pool with a zero clearance “beach” entrance at one end for the enjoyment and safety of youngsters and non-swimmers. 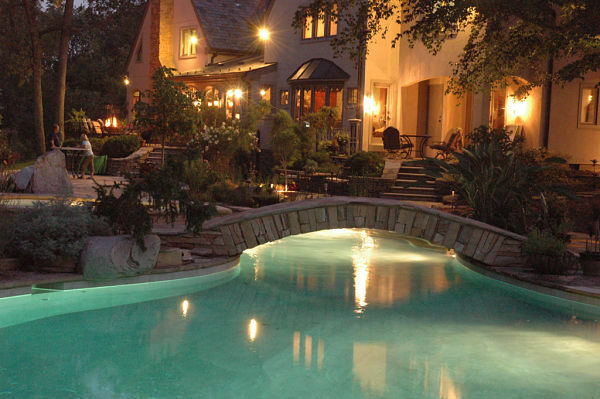 A focal point bridge to provide a convenient passageway to the hot tub and an attractive barrier from the shallow water area to the deep end of the pool. An integrated flat level diving board at the deep end of the pool. 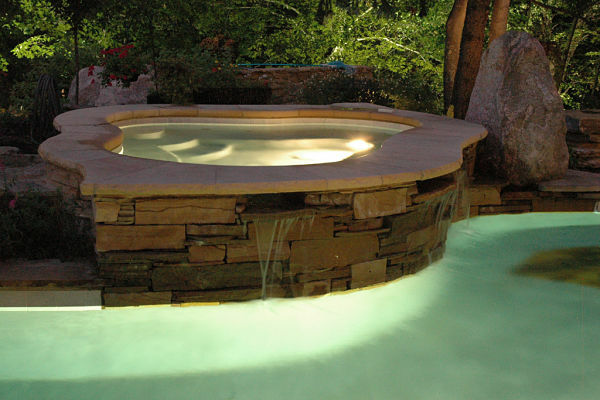 A custom hot tub that would flow into the pool. A firepit installed in a lower level of the yard away from the house and accessible by a long set of steps set into the grade. The use of a variety of natural materials and colorful, textural plantings. 1. A temporary road was built around the side of the house, complete with steel plates to protect the root systems of trees, to provide a passage for dirt-movers needed to grade the pool area and for the transport of supplies. 2. Creating the stone bridge required architectural ingenuity and the skills of artisan stone masons to execute the plan. 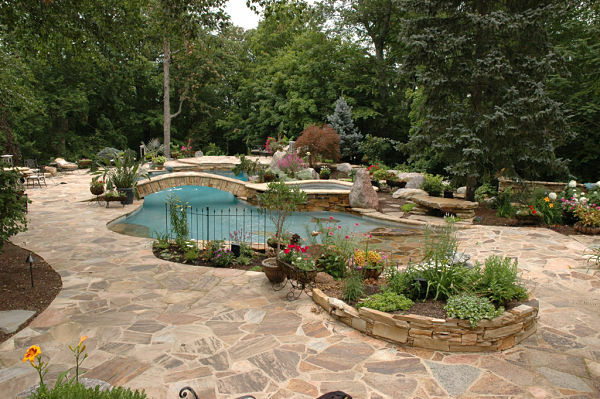 Tennessee Quartzite stone was used for the patios and pathways. The color is a variegated tan, brown and pink sandstone. 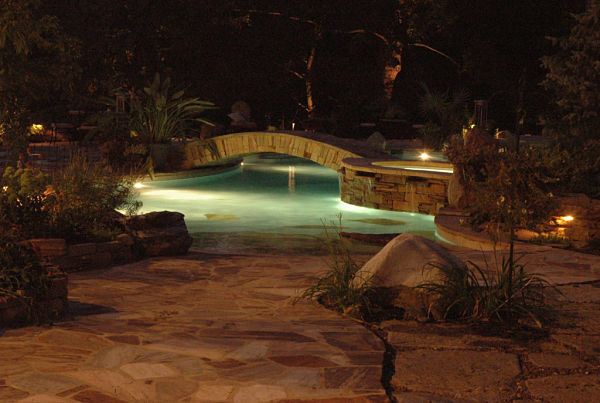 This stone is ideal for pool areas because the surface is fairly flat with a grainy texture to avert slips. 3. 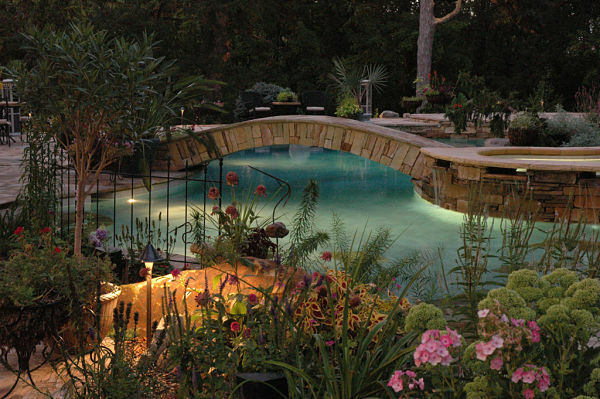 The lagoon-style pool was designed to blend into the landscape. 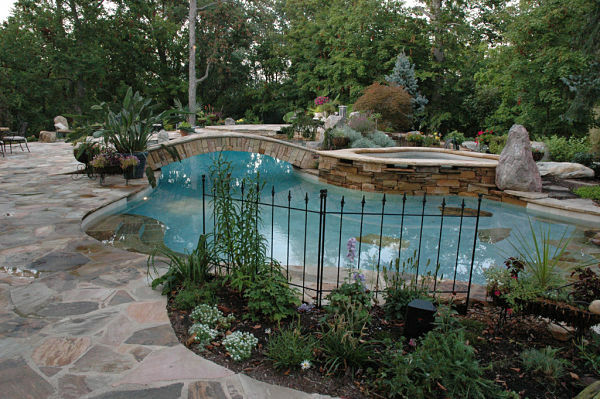 The pool does not have the traditional concrete edging or liner. There is a beach entry into the pool which involves continuing stones from the pathway into the floor of the pool. 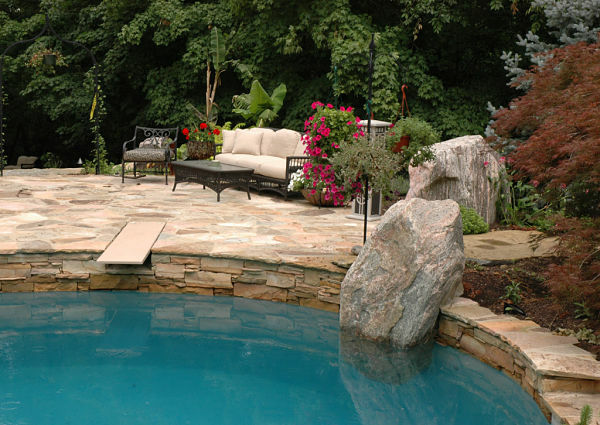 The edge of the pool was constructed with patio stones. 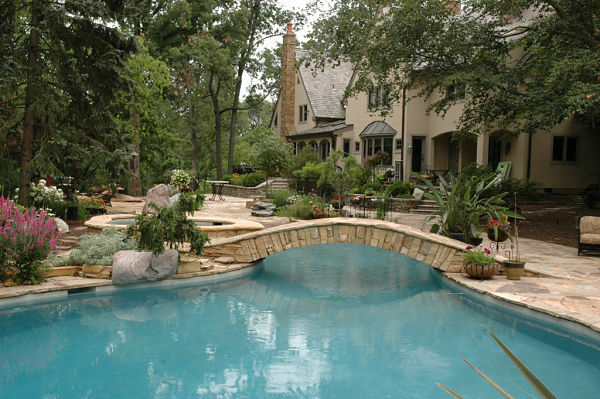 The stacked stone bridge serves as the marker between the shallow and deep ends of the pool and there are no obtrusive depth markers. 4. To keep the diving board level with the stone pavers, the upper patio was lifted. This allows family and visitors to comfortably walk across the diving board, which blends into the landscape. 5. To complement the natural setting, a 10,000 lb. boulder was skillfully chiseled into an L-shape and set over the edge of the new pool. A large portion of the massive boulder rests below the surface of the reflective water. 6. For additional safety, the homeowners decided to add a wrought iron fence to discourage their five dogs from jumping in. 7. 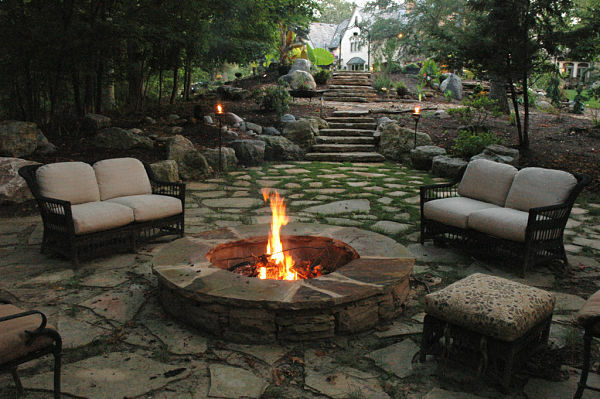 A stone pathway with stairs was constructed to lead to the custom-built firepit and a woodland sitting area in the lower part of the yard. The firepit was fashioned from concrete, stone and dirt. The homeowners sprayed a mixture of moss and buttermilk in the spaces between the stones to create a pathway of moss. Ostrich ferns were also planted in this shade garden area.